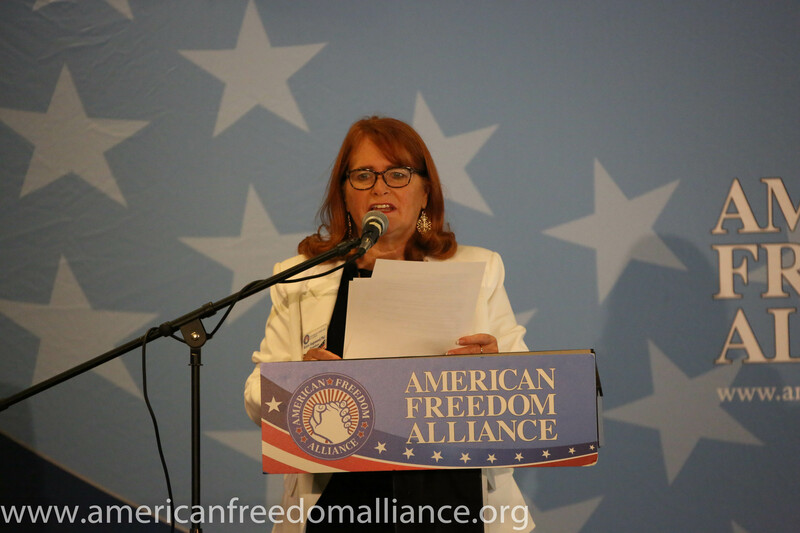 The following is the transcript of the introduction to the conference given by AFA President, Karen Siegemund. 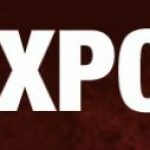 Welcome to the American Freedom Alliance’s conference on FREE SPEECH – how the Left is silencing dissent and how we can fight back. So glad you’re here! Can you even BELIEVE we need a conference such as this!? It’s really astonishing. And yet, this issue – how any voices that dissent from the Left’s narrative are silenced in countless ways – is the number one threat to our freedoms today. There can’t be freedom without free speech. And that’s why it’s protected right there in the first amendment. 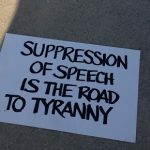 In tyrannical governments, the silencing of any dissenting voice is step one towards ensuring a compliant populace – and free speech is one of the first things to go. What we have here now, though, is not the government applying these jackbooted tactics, but an ideology – a political ideology, playing that same role of tyrant, of suppressing any dissenting voice. And why? Because as long as there is open discourse about the issues of the day, as long as all sides of an issue are aired, the Left knows that their ideas simply don’t stand up to scrutiny. Not. One. Hence the desperate efforts to crush any open discourse. And because they are dominant in every single vehicle of transmitting culture – the media! Academia! including K-12 and the universities, Hollywood! And now also social media and various internet gateways like google and youtube, the power they wield is tremendous. And they use that power to suppress any voices other than their own – and of course, to protect those on their side, despite the despicable, truly despicable behaviors that are being revealed these past weeks. Any dissenting voice is suppressed: Christian, Jewish, conservative, climate “deniers”, those who speak out about islam, about genders and – gasp! MATH! – racist, right? Political correctness is one of the most insidious, dangerous forms of suppressing free speech ever devised – And think about all the COUNTLESS “triggers” that the snowflakes can’t abide – it’s ALL about control, it’;s all about painting those who dissent – YOU AND ME – as EVIL and all the various names they come up for for us. The funniest is “fascist” Because we know who the fascists are – and it’s NOT US. Those who work in Hollywood, in schools, in a whole lot of arenas, are intimidated into silence because the repercussions from the Left against us are so damaging. We each have stories, either our own or ones we’ve heard about someone being intimidated into silence , one way or another. This is tyranny of another type. And this CANNOT stand. As you know, AFA was put on the SPLC hate list because of our conference last year on the topic of Islam. Of course, the SPLC never said what exactly any of our 20+speakers said that was wrong – oh no. It’s the TRUTH that they can’t abide. Not about Islam, not about any of the things that we stand for. Not one word spoken at that conference was untrue. And every word was to plead, passionately, to preserve our freedoms, our safety, our national security, in the face of the determined, deliberate, often violent, usually perniciously destructive effots to destroy Western civilization. Not a word was wrong – as we continue to see borne out, just most recently in NY. But speaking the truth got us on the hate list – WE GOT ON THE HATE LIST FOR SPEAKING OUT AGAINST HATE!! But we live in absurd times. In response, we looked into a lawsuit to fight back against the slander, the lies, and frankly the danger it brought to us, and those who associate with us. But frankly, the asymmetry in this culture war was too great. So we turned to what we do best – Inform! Educate! And most importantly, inspire to action. Knowledge is power – and we hope you use the power imparted to you today to help fight back against the hate and the silencing that the Left is so passionately and wrong-headedly engaged in. Wrongheaded, Because the freedoms we want – are freedoms for THEM TOO! For THEIR children, and their children’s children. So thank you for being here and being engaged in this culture war. And to the SPLC person here today – yeah, we know you’re here – welcome. Please feel free to ask questions of us – we hope you see that all we want to do is ensure that all sides can be heard without fear, without riots, without shouting people down or various kinds of violence. Talk to us – we want to hear what you have to say, too. THANK YOU to our AFA board – Michael Greer; John Hancock, Mark Shaw, Gary Aminoff, Jim Enstrom and Barak Lurie, thank you for all your help, support and wise counsel. Thank you to our volunteers today – Betsy Speicher, Ginny Sand and Marcia Jacobs. And thank you to Keith Hardine, our time keeper. Thank you to our Fellows – John Hancock, Guy Milliere, Howard Hyde and Trevor Loudon and Douglas Gibbs – we’re so proud to have you as part of this organization. Thank you to our MEMBERS and donors – without you none of this could be possible! And we hope more of you will become members today. And a thank you to the Luxe who always does such a great job for us. We are tremendously proud of the amazing program we’re bringing to you today. Every aspect of the Left’s campaign to silence us is represented: the roots of hate; how they stifle dissent on campus, in social media, in Hollywood, in the press. How they obstruct those who have opinions other than their own. We’ll hear about the the various intimidation tactics. But we’ll also hear how we’re fighting back and we think you’ll find it heartening! The line-up we have is truly extraordinary, and AFA is very proud and excited to bring this program to you. Our Bill of Rights alone should be enough to fight back with, but because the Left dwells in its own “reality” as if everyone has their own “reality” and their own “truth,” we must be vigilant in protecting basic liberty and civil rights. We recognize the Left’s dementia as pathological mental dysphoria pushed by academic frauds, greedy political schemes, and elements of foreign enmity.